This exhibit focuses on the booklets of the 1967 Centennial definitives. 18 distinct booklet types were produced. 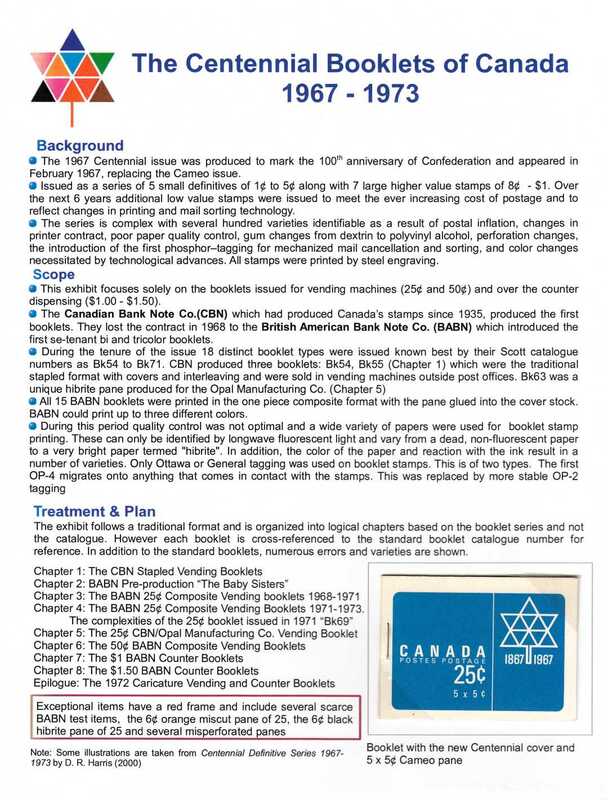 The Canadian Bank Note Co.(CBN) produced the first booklets, but lost the contract in 1968 to the British American Bank Note Co. (BABN). BABN introduced many innovations including first se-tenant bi- and tricolor booklets. The complexity of the Centennial stamps extends to the booklets. There are numerous printing, paper, perforation, gum, and tagging varieties. A previous version of this exhibit was shown at BNAPEX 2012 Calgary where it received a Vermeil. This version, a complete re-organization of the last, was shown at BNAPEX 2017 Calgary where it won a Gold, the John D. Arn White Queen Award, and the APS Medal of Excellence (1940-1980). Copyright © 2018 Joel Weiner. Web design copyright © 2007-2018 The British North America Philatelic Society. The documents on this website are for informational and non‑commercial or personal use only.